Hannah Freedman is in the class of 2017 and an Empower fellow. She is interning with the African Youth Leadership Experience in Uganda this summer. Leaning against a bright blue wall with windows empty of glass, I watch Nakimbugwe Aisha Jadidah standing confidently in the front of the room, describing her mother. “She is responsible, loving, funny, and God-fearing.” Jadidah speaks with her hands, walks across the makeshift stage likes she owns it, and projects her voice all the way to the back of the room. The occasion is a public speaking workshop, and each of the twenty-nine students must make their way to stand at the front of the room and speak extemporaneously on a subject for one minute. This would have been an insurmountable task for most of these students two days before, but today, one after another, each graces the front of the room and we hear speeches on everything from Jadidah’s “Tell us about your role model” to Emmanuel’s “Why is Tanzania the best country in the world?” This is Day Three of the African Youth Leadership Experience, or AYLE, an immersive leadership camp for twenty-nine selected East African fifteen- to eighteen-year-olds, and the past few days have led students through arts-based transformative learning. The students arrived on Day One silent and timid- standing around awkwardly in language or school silos. After trying to engage one or two in conversation, I became skeptical of the camp plan; how were these students going to have conversations on leadership and social change? I was not looking forward to dragging answers and energy out of these kids as a facilitator. However, things changed quickly. 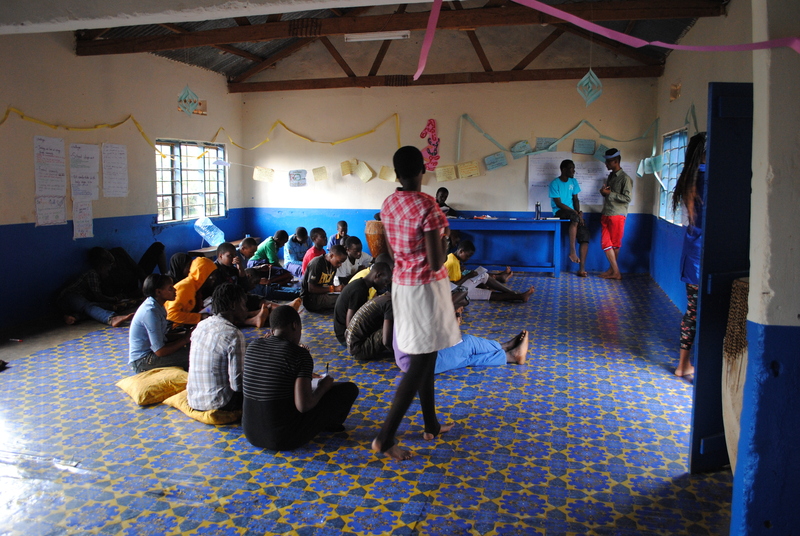 After movement-based name games and creating colorful nametags, the kids started to warm up. In school, these students are expected to stay quiet and give the exact answer the teacher is looking for; creativity is not a necessary skill. To achieve the kind of learning AYLE intends, however, taking creative risks is important. Through the Creative Communities Model, AYLE uses the arts, including movement, music, theater, and creative writing, to build an intentional community of students to develop leadership skills. AYLE students participate in ten days of workshops on leadership, social issues, and project design, culminating in student-planned social entrepreneurship projects for their homes and school communities. I will admit I had my doubts about the power of art. Arts-based learning always seemed so abstract and frivolous, wasting time that could be used in simply teaching or facilitating the session. Since then, however, I have seen the transformations in these students and the strong, intentional community that they have built. The Creative Communities Model is a framework for how to build this kind of safe space, laying a foundation where students feel comfortable taking risks and can then learn faster and with more enthusiasm. It structures a camp experience. We began with a warm welcome and came up with a group contract for the space: community norms that reward risk-taking and questions. We then gave the group challenges—starting with something easy that, once accomplished, made them feel like a team. Each day, the challenges increase, building up confidence and trust as the camp progresses. The arts help accomplish this in two ways. The first is that arts and using creativity is a risk, and taking risks in a group strengthens community. Sharing drawings or songs requires sharing parts of yourself, which in turn builds trust. The second is that creating art relaxes people. It brings people’s guards down, and once they are in this safer space, conversations can happen that access a deeper level of connection. After a few days of singing together, dancing together, and making art together, these students are open and excited about learning. They now feel safe enough with the facilitators and each other to take risks and try things like speaking in front of a crowd. And as students sit down after their sixty seconds, you can see how accomplished and proud they feel. Each sits a little straighter, each feels a little more validated, and each student is ready to bring more to AYLE, ready for the next challenge.